Front of Nelson cottage in Parkgate, Cheshire. Deserted by the sea that once provided its livelihood, Parkgate stands on the Dee estuary. The village is a fascinating place to visit; many of its buildings are unique and some have stories to tell. Nelson Cottage in Station Road has a story, and the property is easily identified by its cobbled frontage. Early in the 19th century this cottage was the holiday retreat of the portrait painter Albin Roberts Burt. Albin had a good reputation and specialised in miniature portraits. Half a dozen of his pictures hang in Britain’s National Portrait Gallery. In November 2016 a London auction sold Albin’s two inch sketch of Lord Nelson for an estimated £12,000. Albin moved around quite a bit in his lifetime, but in 1822 he was living in Chester. In early December that year he decided to visit Liverpool, and took his nine year old son along with him. Historic facts can be difficult to verify, but reports suggest that the journey was done by boat using the Shropshire Union Canal from Chester to Nether Pool: now part of Ellesmere Port. On route he would have passed St Lawrence’s church at Stoak which may have been undergoing restoration at that time. The church dates back to the 14th Century, but was restored in 1827. At Nether Pool, father and son transferred to a ferry to cross the Mersey basin to Liverpool. Having finished their day’s business they began the return journey home. That evening, however, tragedy struck. The Prince Regent steam ferry ran out of fuel and the boat was at the mercy of the strong winds. A hurricane struck the Liverpool Bay area, and nine people fell overboard from the ferry that night including Albin’s son Nelson. Saddened following the loss of his son, Albin walked along Parkgate beach and collected black stones. 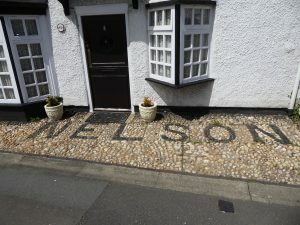 On returning to Station Road he used the stones to spell out his son’s name in front of the cottage. The stones remained loosely in place until the 1920’s when they were set in cement. 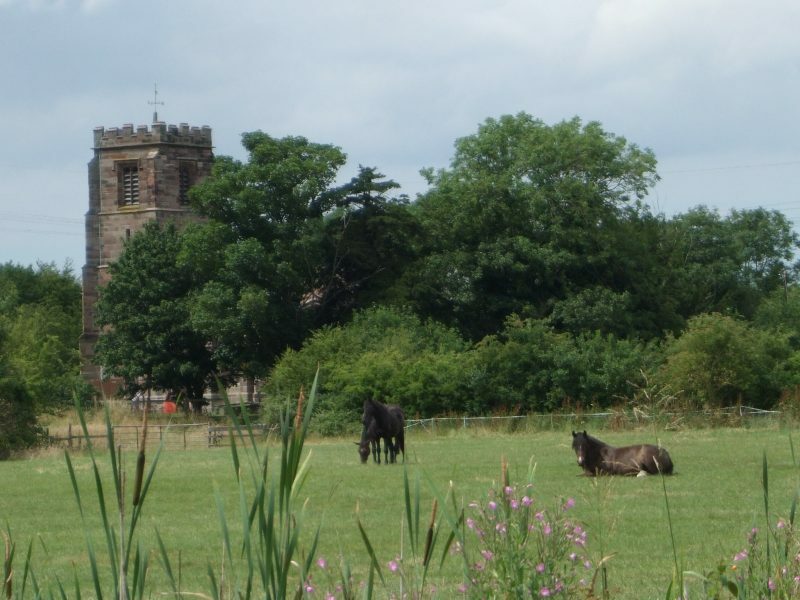 View of St Lawrence’s church Stoak from Shropshire Union Canal tow path. I often cycle along the canal towpath between Chester and Ellesmere Port, and think about the young boy and his father making that last fateful journey. At Stoak, I can see St Lawrence’s church three hundred metres beyond the canal. I have family resting in the churchyard. I’m aware that a small boy lost in a storm almost two hundred years ago also lies there. I’ve known this for many years but until recently didn’t know his name. Whilst researching my article on Parkgate for Best of British magazine I discovered this grave was the final resting place of young Nelson. Grave of Nelson Burt, St Lawrence’s churchyard, Stoak, Near Ellesmere Port, Cheshire. 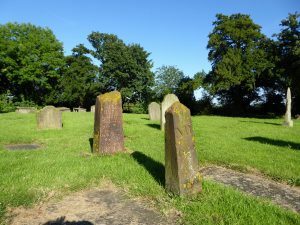 On a summer evening I visited St Lawrence’s churchyard. I could look up my relatives and see if I could also find Nelson’s grave. It wasn’t hard to find; it was the one closest to the south of the church tower. Nelson may have the oldest grave in that churchyard and its position means that he probably gets the maximum amount of sunlight. The headstone inscription explains the circumstances of his death. An interesting thing about this grave is that it has both a head and a footstone. On the 5th December 1822 a small boy died under tragic circumstances. Maybe he could have become a famous painter like his father, or a great leader of men like his namesake. We will never know, but today we still know Nelson Burt’s name because it has been set in stone. 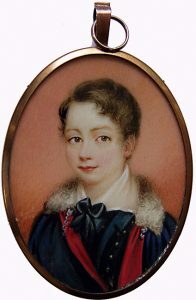 Miniature portrait of Nelson Burt aged 8, painted by his father Albin Roberts Burt.